If you're a serious family camper or a caravanner then a good quality toilet tent for the obvious, as a shower unit, or for storage is an essential take on any holiday. The great new Deluxe Cabin is all three and a must have for anyone needing that extra space. The WC Deluxe also makes an ideal place to change if used for surfing, motorsports or events. 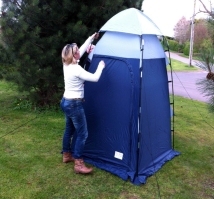 At 120cm x 120cm x 200cm high it has a 120g base and a technical 190T Waterproof outer with canopy hood, which lets in the light but keeps off the rain. With lightweight fibreglass poles it's a lightweight addition to any trip away. The OLPro WC Deluxe Toilet Tent comes in a box with full colour outer sleeve. Instructions are in the sleeve pocket on the front of the bag. It's a very compact and easy to erect Toilet Tent. The construction of the toilet tent is a simple two fibre glass pole set up when the poles cross at the top. The polypropylene fabric of the toilet tent are clipped, using C-Clips to the strong flexible poles and tie straps at the top of the toilet tent mean it is further secured. Even though it is advised that the toilet tent is taken down in stronger winds the flexibility of the unit as a whole means it will flex and move in milder gusts. By gusts and winds we mean from outside the tent! Once the pole have been put through the C clips and attached to the fabric, the bottom of each pole clips onto rings positioned at the bottom corners of the WC Deluxe to allow the unit to free stand. It comes with enough pegs to peg it out and a separate groundsheet if a groundsheet is required. 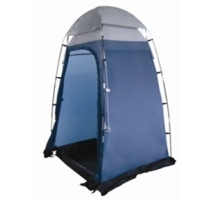 The top of the toilet tent is fully vented and it comes with a separate roof which attaches above the vent making the entire Deluxe WC both breathable and waterproof. Although classed as WC the OLPro WC deluxe makes a perfect tent for storage, as a shower unit, as a changing room for events, or for just getting away from it all! Branded as OLPro the WC Deluxe will be used by both campers and caravanners.